* The Category 6 cable is the cable standard for Gigabit Ethernet and other network protocols. 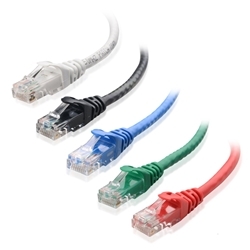 A Category 6 Ethernet Patch Cable is also referred to as a Cat6 Network Cable, Cat6 Cable, Cat6 Ethernet Cable, or Cat6 Data/LAN Cable. * This Cat6 cable supports up to 550 MHz and is suitable for 10BASE-T, 100BASE-TX (Fast Ethernet), 1000BASE-T / 1000BASE-TX (Gigabit Ethernet) and 10GBASE-T (10-Gigabit Ethernet). * Designed with advanced technology, this cable achieves flexibility and portability without sacrificing performance. It is lighter and thinner, yet fully supports the specifications of Gigabit Ethernet.